The man Donald Trump, the controversial U.S. President-Elect, has nominated to be his administra­tion’s secretary of state has been forced to scrub a visit to Guyana this week after he was formally named as the person for one of the more powerful positions in the cabinet. Rex Tillerson was scheduled to meet with Guyanese President David Granger at mid week to discuss ExxonMobil’s humongous oil and gas find of the country’s Atlantic coast back in May of last year. He was due to arrive late Tuesday December 20. 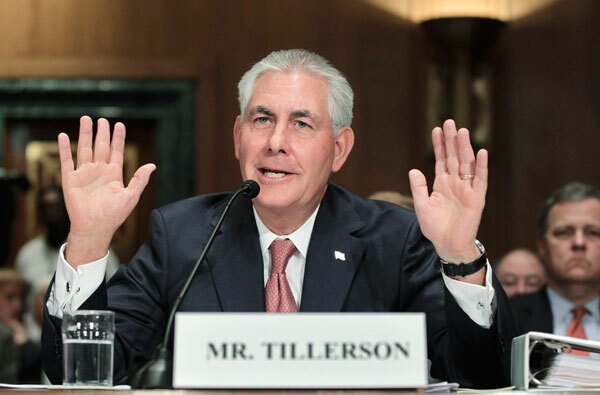 Tillerson is the chairman and chief executive of ExxonMobil, which is the first of many companies to have drilled both on and offshore for oil and gas in Guyana to find such large quantities. Had he not been named to the position, Tillerson would have been the latest in a long line of senior Exxon executives who have been trekking to Guyana to discuss and treat with the Texas-based company’s multi-million dollar operation in Guyana in recent years. He has been with the company for the greater part of 40 years after starting as an engineer and was heading to the Caribbean trade bloc’s largest member nation to discuss a string of very positive latest developments with Guyanese authorities. The visit would have been the first to Guyana, the latest Caricom country with commercial quantities alongside Trinidad, Belize, Suriname, and Barbados. Exxon has drilled a number of successful wells since first announcing that its Liza 1 well contains at least 1.4 billion barrels of oil and an undisclosed amount of gas. Only “Skip Jack,” one of the five wells Exxon has drilled so far has come up dry and the company is holding back on announcing positive results from the “Payara” well, its latest bore hole to avoid messing with international oil prices which have been climbing in recent weeks. Both the company and Granger’s office have confirmed that the visit is off and rescheduled to early next year with whoever is named as Tillerson’s replacement. In all, the company is planning to drill up to 17 wells in the Liza phase with eight pinpointed to actually pump oil, five will be used to reinject water extracted during the extraction process and gas will be pumped back into the remaining four until a decision is made as to what to do with it. Officials say several wells will also be drilled in the Payara phase. So far, indications are that the country is setting itself to become one of the richest and most prosperous in the bloc of 15 nations in the Caribbean Community especially if it avoids some of the pitfalls which have beset other oil producing nations like neighboring Venezuela, and Nigeria as examples. Oil Minister Raphael Trotman says every effort is being made to avoid this. Legislation which had catered mostly to deal with exploration rather than production is being updated, local content clauses requiring companies to hire locals and buy local will be included and professionals are being scrambled for overseas training in areas including petroleum law. This is as the country is being prepared to switch from a raw producer of gold, sugar, bauxite and rice to an oil and gas economy along the lines of neighboring Trinidad. Trotman has also said that a big chunk of revenues from the first few years of production — expected to commence around 2019-20 — will go to Exxon, meaning that Guyana “would be getting hundreds of millions of dollars but once that phase is passed we are talking about billions annually. At today’s prices the Liza find is worth about $70 billion dollars. Hess Corporation with its 30 percent stake and CNOOC with 25 are partners in the project. Exxon has 45 percent and is the active partner or operator in the venture. A number of other companies are exploring or are preparing to drill in the general area near Exxon’s Stabroek Bloc. These include Spanish giant’s Repsol and Tullow oil of the U.K.
It’s an oil industry “dream team.” Just look at the appointments of former Texas governor Rick Perry as Secretary of Energy, ExxonMobil (XOM) CEO Rex Tillerson as Secretary of State, and Montana Congressman Ryan Zinke as Secretary of the Interior. As the former Governor of Texas, Perry has many ties to the oil industry. He sits on the board of both Sunoco Logistics Partners (SXL) and Energy Transfer Partners (ETP) – both companies own stakes in the embattled Dakota Access Pipeline. Zinke is another oil industry favorite. According to the Washington Post, the oil and gas industry contributed more than $345,000 to his campaigns… making them the largest contributors by far. All this means taxes, regulations, and permitting will likely be less restrictive on the U.S.A. oil industry over the next four years. The threat of a ban on the use of fracking to produce oil is gone. The red-tape strangling new pipelines will ease or disappear. And the push for new infrastructure could actually move projects ahead faster than before. The minister said “that a big chunk of revenues from the first few years of production — expected to commence around 2019-20 — will go to Exxon, meaning that Guyana “would be getting hundreds of millions of dollars but once that phase is passed we are talking about billions annually. At today’s prices the Liza find is worth about $70 billion dollars”. So that if Exxon will get 45%, Hess Corporation 30% and CNOOC 25% that leaves 0% for Guyana; would that 0% be just for the first few years of when is it that Guyana will begin to get her share? It wouldn’t only be futile but totally ludricious for Guyana to receive 0 percent. I mean why would the Guyanese Govt agree to such a foolish deal?? Guyana does not have shares in the consortium that is drilling and extracting the oil in the future. Guyana gets a royalty payment on every barrel of oil that is extracted. It is expected that total royalties will be substantial … in the billions of US dollars. The real issue now is the establishment of controls and transparency to ensure that the funds are properly spent and saved for future generations. This process seems to be progressing… but we shall see … hopefully … what the finished “transparency” looks like.